Susumu Tonegawa discovered how the immune system produces millions of different antibodies to combat almost any micro-organism. In doing so, he solved the tantalizing long-term puzzle of antibody diversity. Tonegawa was awarded the 1987 Nobel Prize in Physiology or Medicine for his work. Susumu Tonegawa was born on September 5, 1939 in the city of Nagoya, Japan. Susumu’s father, Tsutoma Tonegawa, was an engineer with a textile company; he was moved to a different small factory town every few years, so the family never settled in one place. Susumu’s mother, Miyoko Masuko, was a homemaker. Susumu’s parents wanted their children to get the best possible education. They sent Susumu and his older brother to live with their uncle in Japan’s capital city, Tokyo, where they attended the renowned Hibiya High School. Susumu’s favorite subject at school was chemistry; he applied to study it at the University of Kyoto, passing the entrance exam at his second attempt. He enrolled at Kyoto in the spring of 1959, age 19. In his senior year, Susumu Tonegawa became fascinated with the molecules of life, such as proteins and nucleic acids. After graduating with a bachelor’s degree in chemistry in 1963, Tonegawa decided to pursue his fascination with molecular biology as a graduate student. He was accepted by the University of Kyoto’s Institute for Virus Research, but after just a few months his doctoral advisor gave him some advice: if you really want to learn about molecular biology go to the United States. Tonegawa followed this advice and in the fall of 1963 became a graduate student at the University of California, San Diego. He graduated with a Ph.D. in 1968, age 28. Tonegawa decided to remain in San Diego, carrying out post-doctoral research at the Salk Institute. In January 1971, Tonegawa’s American visa ran out. He moved to Switzerland to work at the Basel Institute for Immunology, where he remained for 10 years. His first year involved a lot of frustration because he knew very little about immunology. Within a few years, however, his discoveries earned him the Nobel Prize. How Can Our Bodies Make So Many Different Antibodies? Every day our bodies encounter a huge number of bacteria, viruses and other pathogens. When our immune systems detect a pathogen they release antibodies to destroy it. A more general term for anything the immune system responds to is antigen. An antigen might, for example, be a virus or bacterium, or it could be a specific molecule on the surface of a bacterium. Any antigen invading the body will be targeted by a specific antibody. The enormous numbers of pathogens/antigens we encounter every day do not make us sick every day because the immune system is usually effective in targeting each and every one of them with a suitable antibody. The adaptive immune system functions through lymphocytes, a type of white blood cell. 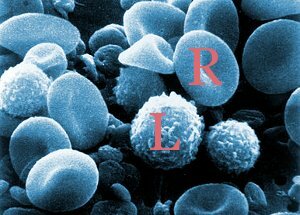 Two varieties of lymphocyte are crucial to the adaptive immune system – these are called B cells and T cells. These cells have binding regions that target and bind to specific antigens. A sample of various blood cells. A red blood cell (R) and lymphocyte (L) are marked. Lymphocytes are a type of white blood cell that respond to antigens. They do this using antigen receptors. Each lymphocyte cell has about 100,000 receptors on its surface. 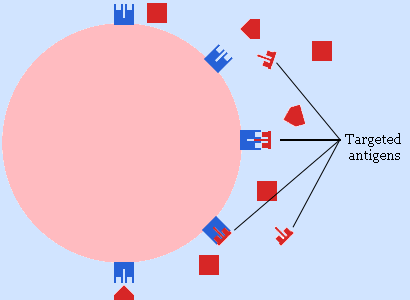 Schematic of lymphocyte. The blue receptors can bind only to a specific antigen. If this antigen is encountered in the body, a process starts that results in the release of a large number of antibodies equipped with the appropriate binding site to attack the specific invader. All the binding sites on a lymphocyte are identical. Antibody diversity comes about because huge numbers of lymphocytes are created with different binding sites. A large number of appropriate antibodies are released to combat a specific antigen. Every different antibody made by our immune systems is a different protein. Humans have about 20,000 genes, each of which can make only one protein. How then can we ever produce the hundreds of millions of different antibodies that are needed to defeat the enormous range of antigens we meet? This – the puzzle of antibody diversity – is the puzzle Tonegawa solved. In simple terms, Tonegawa found that antibodies are not governed by a rule of one gene → one protein. More specifically, he took DNA from the cells of mouse fetuses and discovered that, where antibodies are concerned, genes rearranged themselves. In other words, sections of the DNA molecule moved from one part of the gene to another resulting in a large number of new genes being created each with the ability to manufacture a different antibody protein. The diversity is not seen everywhere in the antibody, but is seen where it is important, in the binding region of the antibody that specifically targets an antigen. This diversity is caused by a reshuffling of genetic material now known as V(D)J recombination. 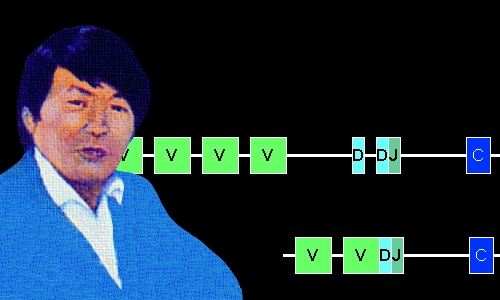 Tonegawa’s work did not reveal to us the whole V(D)J recombination system, but he made the initial breakthrough. He then built on this breakthrough with further discoveries, as did other researchers. A further letter, C, refers to constant, unchanging DNA. In 1976, Tonegawa compared white blood cells, specifically B cells, in mice embryos with adults. From his results, he decided it was likely that sections of the DNA molecules in adults’ B cells had been reshuffled compared with the embryos’. 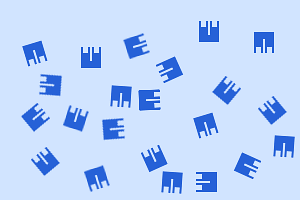 The reshuffling allowed a huge number of diverse antibodies to be produced. In 1978, Tonegawa and his team at the Basel Institute proved their earlier conclusion correct, establishing in experiments that portions in an antibody gene had rearranged. In the following schematic, results obtained by Tonegawa and other workers show how a gene rearranges to produce a new antibody. The right-hand section labeled C is constant and does not change. We begin with a gene – a section of DNA in a B cell that can produce an antibody protein. With the unwanted section gone, the D and J parts recombine. Now a V and D gene segment is removed. Recombination produces a new gene that can produce a new antibody. The entire process is more or less random. If the new antibody proves useful in combating an antigen currently in the body, then the new antibody will be produced on a large scale. In 1981, Tonegawa left Basel for the Massachusetts Institute of Technology in Cambridge, Massachusetts. There he continued researching problems in immunology for about 10 years, before switching his focus to the brain, trying to understand how we learn and how memories are created and stored at the level of molecules and cells. Working with genetically engineered mice, Tonegawa found he could use light (optogenetics) to study the specific cells that hold memory information in the part of the brain called the hippocampus. He found each memory is held by a population of cells. If such a population of cells is stimulated with light from an optic fiber sitting in the hippocampus, the mouse will behave as if it is recalling a memory. False memories can be implanted in mice. By locating the brain area in the hippocampus associated with fear, Tonegawa discovered this area could be artificially stimulated so that mice with no reason to be fearful act fearfully. Tonegawa hopes that his work will lead to breakthroughs in Alzheimer’s disease, amnesia, and depression. Tonegawa has a reputation for being a dedicated and highly competitive scientist who works long hours rather than socializing. He is a Boston Red Sox fan. In 1968, he married Kyoko Sakita, a pottery and ceramics artist. The couple divorced in the early 1980s. In 1985, Tonegawa married the Japanese television reporter Mayumi Yoshinari. She became a graduate student at MIT, studying cognitive science, before becoming a science writer. The couple had a daughter and two sons: Hanna, Hidde, and Satto. Hanna qualified with a degree in music from Skidmore College and Hidde with a degree in cognitive science from MIT. Satto took his own life while in his freshman year at MIT. "Susumu Tonegawa." Famous Scientists. famousscientists.org. 23 Sep. 2018. Web. Bruce Alberts, Alexander Johnson, Julian Lewis, Martin Raff, Keith Roberts, and Peter Walter.